Description: Elementary, Science and Spanish teachers alike will enjoy this standards-based workshop about volcanoes, geological processes, tropical ecology, biodiversity and conservation of rainforests in Latin America. Rocks preserve the most extensive record of the evolution of the planet, from which we are able to retrace the Earth’s history over 4.5 billion years. Guilherme Gualda, Associate Professor of Earth and Environmental Sciences at Vanderbilt University, will explore the geological processes related to the breakup of South America and Africa and the opening of the South Atlantic Ocean some 130 million years ago. 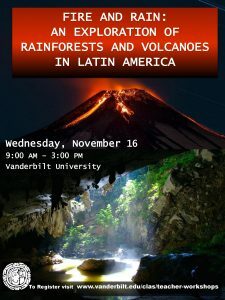 Maria Luisa Jorge, Assistant Professor of Earth and Environmental Sciences at Vanderbilt University, will discuss tropical ecology, biodiversity and conservation of rainforests in Latin America. Jennifer Bradham, Ph.D candidate at Vanderbilt University specializing in ecology and conservation biology, will share field investigations conducted earlier in 2016 as well as provide tools for project-based learning. Note: This is not an exhaustive list of standards that may be addressed in this workshop. These are examples of Tennessee academic standards that teachers may find useful. Please use this only as a guide; we encourage teachers to adapt and modify content as they believe appropriate for their classrooms.